Heidi Thompson (Wunderli) was born in Vernon, B.C. Canada. After graduating high school she moved to Europe to study art. From 1975-1979 she attended the University of Art & Design in Zürich earning a Swiss Diploma for Professional Photography. She then moved to Nürnberg and apprenticed with German painter Oskar Koller. Koller recommended that she continue her art education at the Akademie der Buildene Künste Nürnberg. Thompson was accepted and spent one year under the guidance of Professor Ernst Weil, However, seeking a more traditional art school, Thompson moved to Budapest to study painting with Professor Kokas Ignac at the Hungarian State University for Fine Art. In 1982, Thompson returned to Canada and worked as a freelance photographer, painter and book publisher. She married Edward Thompson and had a family. 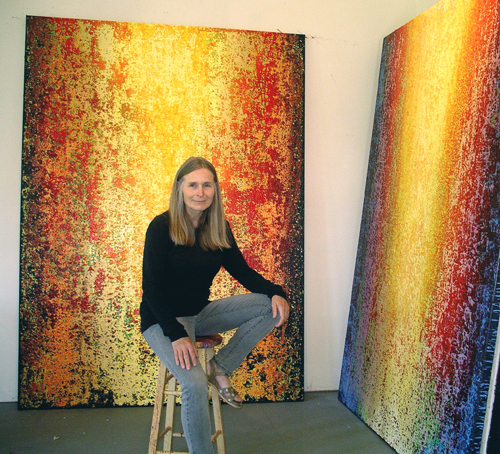 Currently, Heidi Thompson paints full-time and exhibits her work in Europe, Canada and the USA. I am inspired by Impressionists Turner, Seurat, Van Gogh, Monet and Expressionists Gerhard Richter, Mark Rothko and Mark Tobey. Contemporary artists who inspire me include Joseph Marioni and Natvar Bhavsar from New York. These artists, even when painting "realistically" break up their image into particles of light, colour and movement. Much of their work appears to be a glowing, unified field of energy. For me, art is about energy. I strive to create paintings that elicit an energizing experience, Over the years I have developed a style I call “energy field painting”. I found certain combinations of colour, light flecks and lines moving in an illusion of space trigger physical vibrations. Maybe this "feeling" is what Kandinsky, who studied the physiological and spiritual attributes of colour. described as innere Klang or inner resonance. Some viewers while standing in front of my monochromes have felt a flow of subtle sensations. I've heard them comment... "I don't know what I'm looking at, but the painting makes me feel peaceful." 2019 Vernon Art Gallery "The Light Within You"
2016 Kelowna International Airport "OK Sunshine"
2016 Vernon / Headbones Art Gallery / "Ok Artists"
2016 Ottawa / The Cube Gallery "Blue - A Group Show"
2015 Lake Country Public Art Gallery "They Tell You Where to Go"
2010 Atlanta / Bill Lowe Gallery "Bloom: The New Abstraction"
1978 Zürich / Witikon Community Centre "Zürich Chamber Orchestra"
"Particle physics comes to mind when looking at each of these paintings, for they engage in a dialogue of form and content. There is no labeling or identification with conventional representation, nor is the shaping, or containment of form part of the language of Thompson’s art. Superficially they can be compared to Seurat’s pointillist paintings such as A Sunday Afternoon on the Island of La Grand Jatte (1884) for the particularization of matter ends up creating a kind of tonal vibration throughout."